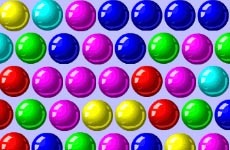 Use the mouse to launch the spheres of different sizes to blast the stacks of the blocks on the platform. You will have to get certain scores ton pass the levels of the game. Each new level of the game brings in even more difficulties but the increasing difficulties of the game makes the game play even more exciting. Have fun playing the game.